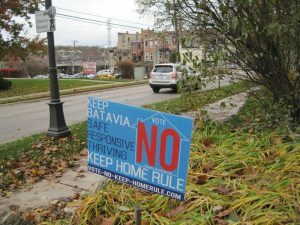 In the midterm elections, Batavia residents voted to keep the Home Rule law that allows the city to make its own decisions, separate from the state. The ballot read “Shall the city of Batavia cease to be a home rule unit?’ and by a wide margin, people voted no. With 2,959 yes votes and 9,159 voting against the proposal, the people voted to keep Home Rule. Home Rule shifts the authority from the state level to the local level. This allows for decisions on tax, regulations, and debt. Any town with a population of at least 25,000 people is automatically eligible for this status. For Batavia, Home Rule came into effect after a census in 2009 showed that the population exceeded that number. Many communities nearby are also Home Rule such as St. Charles, Naperville, Aurora, and many more. Crime-free housing is just one of the numerous programs that the Home Rule law allows. The ability for the 14 aldermen in Batavia to have the power to raise taxes and create programs has raised questions among the community. The referendum, which in this case is law binding, was added to the ballot by a petition, showing there were enough people in the community that felt the power given to the alderman is too much. Callahan argued that giving the power to the alderman is beneficial as most people have an alderman in their neighborhood, or even within a mile of their home. This means if a Batavia citizen has an issue, aldermen are accessible and it’s easy to go talk to them about it. When the decisions are made at the state level, citizens are speaking to someone who represents a lot more people. The alderman, who are elected every four years, can be voted out if they are abusing their power. Callahan, who is in his second term, said that he did not mind the question being raised on the ballot. He has already said he will only serve two terms, so not having Home Rule would only change things for the last two years of his term. The question was asked, the people answered, and it’s clear, at least for now, the people of Batavia want to remain Home Rule.